Read our essential guide to the The National Institute for Health and Care Excellence (NICE) quality standard on mental well-being and independence for older people. The UK population is ageing rapidly, with the number of people aged 65 or above rising by almost half in the past three decades. By 2035, it is estimated that almost one in four people will be aged 65 or more. According to the Mental Health Foundation (MHF), five key factors affect the mental health and well-being of older people: discrimination, participating in meaningful activities, relationships, physical health and poverty. In December, NICE published a new quality standard on mental well-being and independence for older people. It includes identifying those at risk of decline; offering tailored, community-based physical activity programmes, such as walking schemes, and a range of different activities to build or maintain social participation. Older people are at a higher risk of developing chronic health conditions, such as diabetes or osteoarthritis, and they are also more vulnerable to mental health problems. Around one-fifth of those aged 65 and over living in the community are affected by depression. The risk of older people experiencing a decline in their mental well-being and independence is influenced by some life events and circumstances, says NICE. These may include being widowed or divorced; retiring or being unemployed; or having a physical disability or illness. 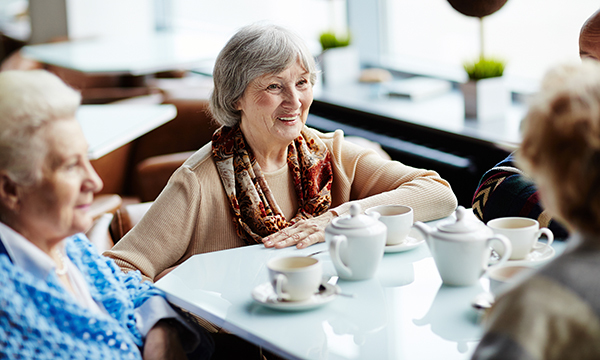 Social isolation can be a particular concern for older people. According to the Campaign to End Loneliness, lacking social connections can be as damaging to health as smoking 15 cigarettes a day, with loneliness increasing the likelihood of mortality by 26%. It is also associated with increased risks of coronary heart disease, stroke, high blood pressure, the onset of disability, cognitive decline, dementia and suicide. In contrast, encouraging older people to take part in physical and social activities can help prevent loneliness and social isolation, improving or maintaining mental health. Ask your patient who they might see during an average day and whether they go out much or have people to visit. If they say no, you can follow up by asking whether they feel lonely or fed-up, and would like this to change. You can also play a role in promoting the benefits of exercise to patients, aside from physical fitness, including making friends, increasing confidence and improving their quality of life. ‘For older people, what is really coming to the fore now is the enormity of loneliness. From a nursing perspective, we are much better at identifying whether someone is lonely or at risk of it, and we know it has a bad impact on their health and well-being. The list of triggers given by NICE is useful: for example, if someone is recently bereaved, retired, has had to stop driving or is a carer, there is clear information provided, and I like that.